Okay, okay, I’m getting emails from people about my cliff-hanger. Sorry about that. It was kind of fun but also kind of serious. I got up this morning fired up to expand on this idea I mentioned and ready to tell you all about it. But I didn’t know how to explain it without all the pieces worked out. And then it occurred to me – what if I had this all wrong? Who was I to assume that I know what you want? So I have decided to make sure that I am about to give you what you want. I now have a solution to this dilemma but first I want to tell you a story that haunts me. When Dario was young, we used to live in a different house just 100 metres along from the beach and most days in summer we went for a swim after his home-schooling lessons were over. One day, I was sitting on a bench up on the grass verge above the beach while Dario played below in the sand, and an old man came and sat down beside me. We got talking and he had gone for a walk because his wife had had a stroke a few days before and was in hospital. He found his house unbearably lonely. His wife had cooked and cleaned for him for the last 60 odd years and he had no idea how to even boil an egg. Dario called up that he needed to go to the toilet, so we went home since it was nearby. Afterwards, I wished I had asked the old man for dinner and started looking out for him every day we went to the beach, but I never saw him again. In the years since, I have often thought about him – he was so sweet and vulnerable. I think the moral of the story is to reach out to help lonely people whenever you can. Not only will they feel better but so will we. I am sure he will haunt me forever and I wish I could turn back time. There is a difference between being alone and being lonely. You can be perfectly content when you are alone and you can be lonely in a crowd of people. Many lonely people reach out to me through my blog and I do what I can to help them but I know there is more I can do. There’s an element of loneliness in most of the stories you have shared with me about your IBS. I have hundreds of these stories collected over the years of this blog but these are extracts from the very latest. I have just watched your video - it's actually quite nice to hear someone else talking about their IBS problems as I feel like I am the only person who is suffering with it at times! I used to be such a carefree person where nothing really bothered me in life but now I am a very anxious person and worry about dreadful things happening to me and friends and family! So that is me. Long story but I must say it feels good to get it all down on paper so to speak and tell someone my story. I only learned last year that IBS can come from trauma and stress and I began to realise that perhaps my negative uni experience followed by my dad's illness could have been the catalyst. It started a couple days after the surgery with just a little but not the usual painful symptoms. Then it hit full force on a weekend of course, then I tried contacting my GI by email (which was a mistake). I spent 10 days in bed and I don't go to bed when I'm sick. I had no food in my system for 14 days. My son got me a sports drink that kept me going(!?) somewhat, lost 18 lbs and finally got on my medication which helped for a month then started with diarrhoea again from the medication. then I’d really appreciate you giving me an opinion on something. Here’s how you can do that – just complete this questionnaire HERE. There are only 3 questions and it will take no more than 3 minutes (unless you want to write me an essay of course). If you fill it in then the gods of good luck will shower benevolence upon you for all eternity. I promise. The survey can be anonymous but, if you leave your name, then you will be on my special list and believe me that is going to be invaluable going forward. You can always email me instead on lowfodmapcoach@gmail.com if you prefer to send me your answers directly. Thanks a ton. I am grateful. This is a very flavoursome recipe which I used to make in Italy. It has all the flavours they are known for. It takes a little while to cook but no time at all to prepare. It could be a good appetizer for a special meal and will wow your guests. Dario is off on a road trip around New Zealand with his girlfriend, Alex, hence there being only two stuffed pepper halves. We also had the roast chicken and vegetables you can see in the background of the photo. Cut the peppers in half lengthwise and remove the seeds and white flesh. Mix all the ingredients except the tomatoes and water. Mix the water and tomatoes together, season it and place in a baking dish. Place the stuffed peppers in the tomato mixture. Place in the oven for up to an hour. When the pepper are soft, remove and serve in the baking dish. Oh, I’ve had regrets like that, too. I’m certain you provided comfort to that lonely man via your conversation 🙂 These stuffed peppers look divine—they’d be an excellent side for company, but I’d happily make them for a weeknight dinner, too. P.S. I think I’ve finally readjusted to the time change and our furnace is working quite well, thank goodness! Bill is back home as his mom is doing much better. Whew. I hope I helped him, however minimally. Glad to hear the furnace is fixed and especially that your mother-in-law is feeling better. That must be a great relief. Responded! Just a quick question: Would it be okay to add whole cloves of garlic into my food while cooking it (e.g. a chili) if I remove them before cooking? It seems like it’s the same idea as garlic-infused oil to me but just wanted to check to be sure! The fructans in garlic are soluble in liquids but not in oil. If your chilli has any liquids like water or tomato juice in it then the fructans will come out into the chilli. If it is cooked purely in oil, then it would be fine. It is much safer to use garlic-infused oil. Thanks so much! Can I take it that it would be okay to sauté the garlic in oil at the start and then take it out before adding other ingredients? I am also a firm believer in treating the whole person: body, spirit, soul. 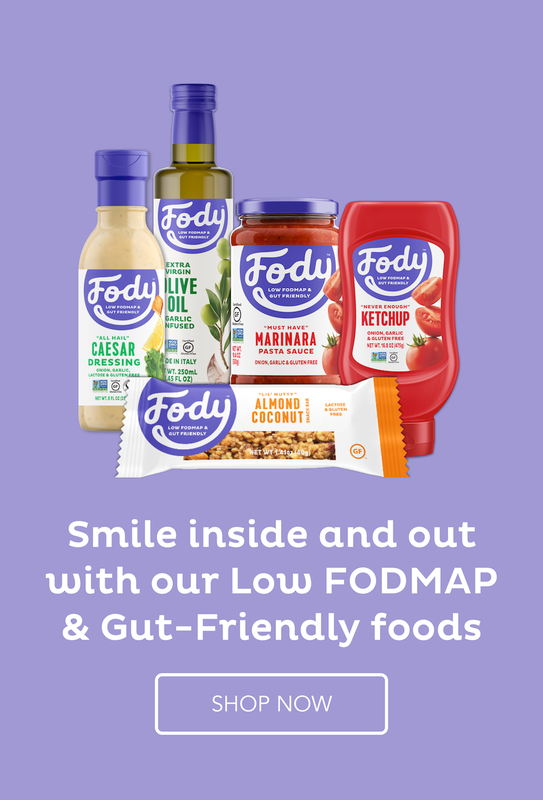 Which means that in order for me to be wholly well; I not only have to follow the FODMAP diet, but I also have to address any inner healing that is required. I am so sure that physical symptoms manifest inner heart issues; for example, an unhappy gut might mean more than just an IBS diagnosis, it might be because of years of carrying unforgiveness in ones heart. I really value the idea of addressing all the areas of the body in order to attain whole health. I am with you all the way, Jenn. It’s also about living a balanced lifestyle to reduce stress and increase well-being. IBS is a complex beast. Ah, yes, life is full of little and big regrets but we are imperfect creatures and we do the best we can in that particular moment. Looking back with the eyes and knowledge of the present day is a rather false way to see the past.